Transitioning to a Medicare-for-all system would no doubt be really, really hard. It would require unwinding a multi-billion dollar health insurance industry that employs about a half-million Americans. Private health insurers exist at the core of the American economy; as the New York Times pointed out this weekend, insurers’ stocks are a staple of the mutual funds that often make up our retirement accounts. Both the Medicare-for-all plans I’ve read and the interviews I’ve done with their authors in Congress suggest that more prep work is needed for the massive upheaval that would come with eliminating private insurance. Building a Medicare-for-all system would be hard, but there is nothing about America that makes single-payer an impossibility. The experience of other health care systems suggests that, with enough political will, single-payer advocates can overcome the exact type of opposition Brooks discusses. There is no better place to learn this lesson than from our neighbors to the North in Canada. Brooks cites Canada as a country where people “love their single-payer health care system.” Brooks brings up Canada as an example of a country that is different from ours, one where there is widespread acceptance of more government involvement in health care. But it wasn’t always like that. Canada experienced massive upheaval and protest when its single-payer system launched in 1962. Back then, Canadian single-payer opponents were making the exact same arguments against the program as American single-payer opponents do today: that it was too much government in medicine, that physicians would no longer be able to practice medicine in the way they saw fit. The doctors even went on strike (for more than three weeks) when the system launched. The history of Canadian health care, it turns out, can actually offer a glimpse of what America’s future could look like if a committed government tried to enact Medicare-for-all. Douglas followed through on that promise: In late 1961, his government passed the Saskatchewan Medical Care Insurance Act. The province already had government-sponsored hospital insurance, but this new bill would layer on a plan to cover doctor visits. There was no comparable insurance scheme for doctor visits, which meant that patients could still end up with a significant bill from the doctor who saw them in the hospital. Some doctors did participate in smaller, publicly-run health plans that cities offered, but many found it more lucrative to accept private payments from wealthier clients. But Douglas refused to back down. On July 1, 1962, Saskatchewan launched North America’s first universal, government-run health insurance scheme for hospital and doctor visits. That same day, Saskatchewan’s doctors went on strike. Groups sprung up around Saskatchewan to support the striking doctors known as KODs, which stood for “Keep our doctors.” They organized a rally at the provincial capital, and thousands attended. Some of the participants carried small effigies of Premier Douglas, hanging from a noose (you can see them in the archival clip from the Canadian Broadcasting Corporation below). Day by day though, the strike seemed to lose momentum. Turnout for that rally wasn’t nearly as high as the organizers had hoped. Patients wanted their doctors back. Meanwhile, the government refused to back down on the idea of government-run health insurance for all. Saskatchewan flew in a British doctor to act as negotiator, helping the government and the doctors broker a deal. That deal became known as the Saskatoon Agreement. The doctors acquiesced to the single-payer system. The government, for its part, agreed that the doctors would remain independent contractors (rather than government employees, similar to how the National Health Service in Britain employs their doctors). The doctors went back to work and single-payer began to spread to other provinces. British Columbia created a medical insurance program in 1965, largely modeled on Saskatchewan’s system. In 1966, the federal government passed a law where it would kick in money to finance these provincial health systems. The promise of federal funding quickly encouraged more provinces to create their own Medicare programs (including the most populous province, Ontario, in 1969). Within 10 years of the Saskatchewan doctor strike, all of Canada was covered with government-sponsored health insurance. “You have a single province who did it alone and then, a legislative framework that said these are the national standards in just three years,” Marchildon. Brooks is right: Canadians are really proud of their health care system. In 2004, the Canadian Broadcasting Corporation ran a primetime special where they had millions of viewers vote on who was the greatest Canadian. 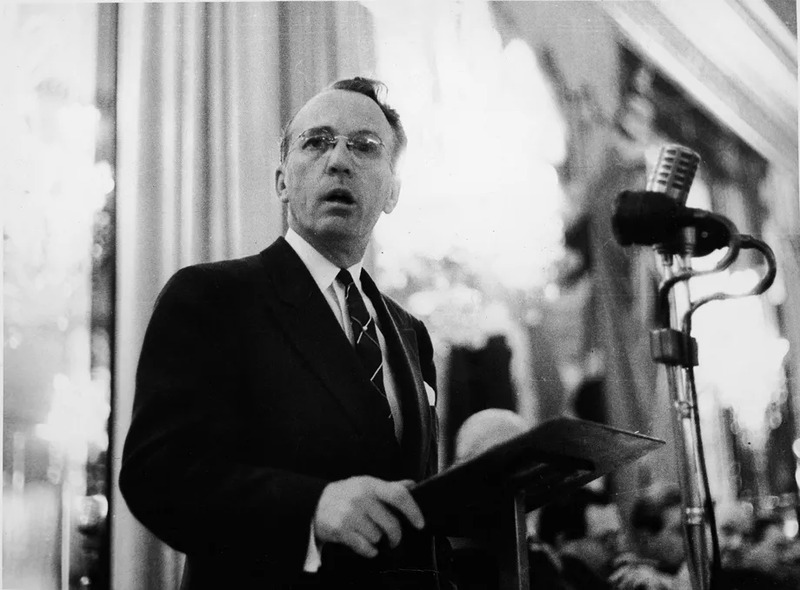 The winner wasn’t a hockey player — it was none other than Tommy Douglas, the father of Canada’s health care system. There are foundations and even a four-hour biopic film all devoted to Douglas, who is a pivotal figure in Canadian history. Canadians are so proud of their health care system that it makes it hard to remember that there was a time when it was really controversial. The moment that it launched was a moment when it seemed like the whole thing might collapse. If a future president tries to pass a Medicare-for-all system, it will undeniably be a brutal fight. There was a bruising political battle over the Affordable Care Act when it was passed, and that plan was significantly less disruptive than single-payer would be. As more Democrats endorse the idea, health care industries are already creating new coalitions to fight back. Who knows, maybe the doctors here would go on strike too! A Medicare-for-all fight would be hard because that type of system requires massive change. That was true in Saskatchewan in 1962, and it’s true in the United States. But hard and impossible are two quite different things, and there isn’t much that convinces me that we fall into a different category. I asked Marchildon how he felt about this comparison: Is it fair to compare pre-single-payer America to the pre-single-payer Canada of the 1960s? Sarah Kliff is one of the country’s leading health policy journalists, who has spent seven years chronicling Washington’s battle over the Affordable Care Act. Recently, her reporting has taken her to the White House for a wide-ranging interview with President Obama on the health law — and to rural Kentucky, for a widely-read story about why Obamacare enrollees voted for Donald Trump. Sarah is a senior policy correspondent at Vox.com, where she focuses on the Republicans’ effort to repeal Obamacare — and what that will mean for the millions of Americans who rely on the law for coverage. At Vox, she hosts The Impact, a podcast about how policy effects real people. She is also a co-host of The Weeds podcast with Ezra Klein and Matt Ygelsias. She resides in Washington, DC with her husband and a very friendly beagle named Spencer. We live in a world of too much information and too little context. Too much noise and too little insight. And so Vox's journalists candidly shepherd audiences through politics and policy, business and pop culture, food, science, and everything else that matters. You can find our work wherever you live on the internet — Facebook, YouTube, email, iTunes, Instagram, and more. Vox was launched at Vox Media in 2014 by founders Ezra Klein, Melissa Bell, and Matthew Yglesias.